Writing for children is particularly popular among writers. It's not a new phenomenon, but I've become more aware of it in recent times. Perhaps with the success of the Harry Potter series and Twilight and so on, we adults can sometimes be taken by surprise by how popular children's - and young adult - literature actually is. Especially people like myself - my kids are the furry kind who, strangely, have not shown any interest in books! I have nieces and nephews who range in age from under 10 to early 20s and I'm pleased to say they all read. They always say that to be a writer you must read and I think that's true. But regardless of whether your children express interest in being writers or not, I personally believe that they should be introduced to the joy of reading. 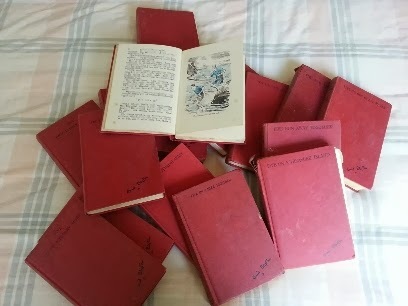 I mean, who doesn't remember the wonder and mystery of Enid Blyton? The Magic Faraway Tree, Bimbo and Topsy, and of course the Famous Five series of books. All 21 of those were written over a period of some 20 years. I read them several times over and even, with all the solemnity of a 10 year old literary critic, recommended and lent them to my school friends. Dr Seuss...Are you smiling? I bet you are and all I had to do was mention the name! I think you'd have to go a long way to find someone who has never read and loved a Dr Seuss book. Show me an Australian kid who's never read a Mem Fox and I'll show you a kid who has missed out! Other Australian children's authors like, the late Nance Donkin, Graeme Base, (born in England but we'll claim him anyway) and too many others to mention, practically raised me. Then there's Where the Wild Things Are by Maurice Sendak - what an adventure! Who didn't wish their bedroom could be as magical? One of my particular favourites was The Hundred and One Dalmations by Dodie Smith. Wow I loved that book! But even more, I loved the sequel, The Starlight Barking. As we grew older we had C.S. Lewis, Judy Blume, J.M. Barrie and Dodie Smith's I Capture the Castle. The magic of the written word is enhanced by those wonderfully imaginative children's illustrators. A friend of mine, Shane McGowan, is one such illustrator. Shane took on the tasks of both illustrator and writer when he published Evie's Mad Hair Day - a rollicking read for any kid! Think about those books you loved as a child. Those stories that enchanted you and the images that inspired you. Do you have a favourite - one that stands out in your mind? Perhaps, like me, your childhood was a series of adventures within pages, a dash from one book to the next with hours spent trawling the local library, the school library and, joy of joys, the second hand book shop! What precious gems at rock-bottom prices did I find in those places! What heaven! To have never had these experiences ... to never know that purest pleasure, that anticipation upon opening a new book at Chapter One and having the characters introduce themselves, would be a tragedy of immeasurable proportions. Without my childhood books, I honestly don't know who I'd be now. It's unlikely I'd be a writer. The value of writing for children should never be underestimated. I'm not a children's writer, and to be honest I wouldn't know where to start. But to those of you with that unique talent I take my hat off! Keep up the writing. Keep getting those stories down and out there to inspire and enchant the generations following us. And Julianne - this is for you. Pull your finger out! These are my original Famous Five books. Passed from my mum to her sister, to me, to my cousin and now back to me for safe keeping.